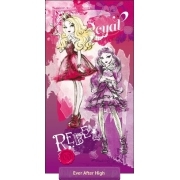 Ever after high is the latest collection of bedding sets and accessories for girls from official Mattel merchandise, referring to the collection of dolls – the descendants form the most famous heroes of fairy tales – and animated series with the same name, whose plot revolves around a school of struggle heroes of fairy-tale teenage descendants divided into two groups Royals and Rebels. 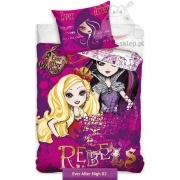 Highest quality bedding sets Ever after high, towels and other accessories with the series characters for girls. This time, Mattel has prepared a great collection, but that does not deter creates descendants of the most popular forms of fairy-tale characters like Raven Queen, Briar Beauty, Apple White, Alistair Wonderland, Madeline Hatter, Ashlynn Ella, Dexter Charming, Cedar Wood, Cerise Hood, Helga Chrumps, Jackob Chrumps the fairy tales of Sleeping Beauty, Alice in Wonderland, Red Riding Hood, Pinocchio, Hansel and Gretel and Cinderella. Excellent styling dolls transferred to the kids bedding, textiles and accessories for children is a real treat for fans of the series.